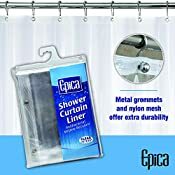 You’ll Never Go Back To Flimsy Plastic Once You Experience The Epica Difference Most shower curtain liners are made of thin plastic and are more trouble than they’re worth. Epica’s heavy-duty 10-gauge vinyl liners are strong and durable - they won’t rip, tear, or billow. And they look great on their own, for that minimalist modern look. Curtain Rings Will Never Rip The Holes In Your Epica Liner The ripped out curtain ring is a standard feature in most cheap plastic liners, but Epica goes the extra mile by giving you a reinforced nylon mesh header and rust-resistant metal grommets. Your liner will never tear free from the curtain rings. Great News For Asthma And Allergy Sufferers - Mildew, Mold And Bacteria Hate This Liner Shower curtain liners are normally a breeding ground for mildew and bacteria. But Epica liners are specially treated to resist the growth of mildew, mold, and bacteria for up to 15 months. Soap scum and stains wipe off easily. Just don't put it in the dryer or try to iron it and the anti-mildew finish will last for years. 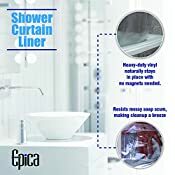 Versatile Liner Looks Great As A Shower Curtain Whether you choose to use the Epica Vinyl Liner by itself because you are budget-conscious or because you prefer the chic look of the crystal clear vinyl, you won’t be disappointed. This liner is made to last for years. 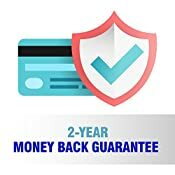 100% Satisfaction Guarantee When you order your new Epica Vinyl Shower Curtain Liner today, you are guaranteed to not have to worry about ripping, tearing, or mildew for a full 15 months, or we’ll send you a replacement. 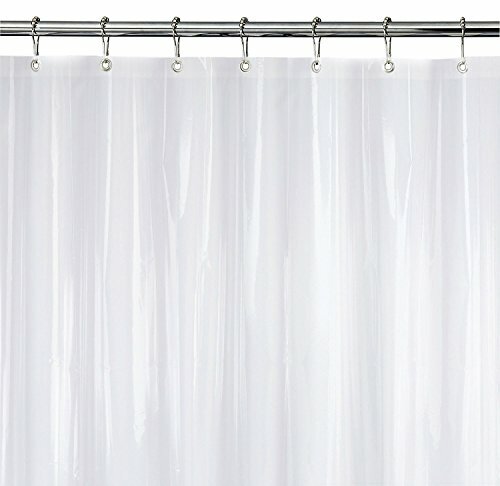 HEAVYWEIGHT 10-GAUGE CLEAR VINYL DRAPES SOFTLY: You can use the Epica Shower Curtain Liner with or without another shower curtain - it looks that great. The heavy-duty vinyl wipes clean easily. NO MORE MOLD AND MILDEW: Our liners have been specially treated to be resistant to bacteria, mold and mildew for up to 24 months, making them the perfect choice for allergy sufferers. REINFORCED NYLON MESH HEADER WITH RUST-PROOF METAL GROMMETS: Your curtain eyelets will never tear because Epica uses metal grommets and a nylon mesh header for extra strength and durability. THE HEAVYWEIGHT VINYL STAYS IN PLACE WITHOUT MAGNETS: Thin plastic liners billow and need magnets to stay in place, but the Epica liner drapes nicely and stays down naturally because it's thicker. 100% RISK-FREE WARRANTY: Epica Shower Curtain Liners are guaranteed to resist mildew for up to 2 years. If your liner rips, tears or doesn't perform up to standards, you are covered.